How many days to stay in Lijiang? Where to sleep in Lijiang? Where to eat in Lijiang? How to get to Lijiang? 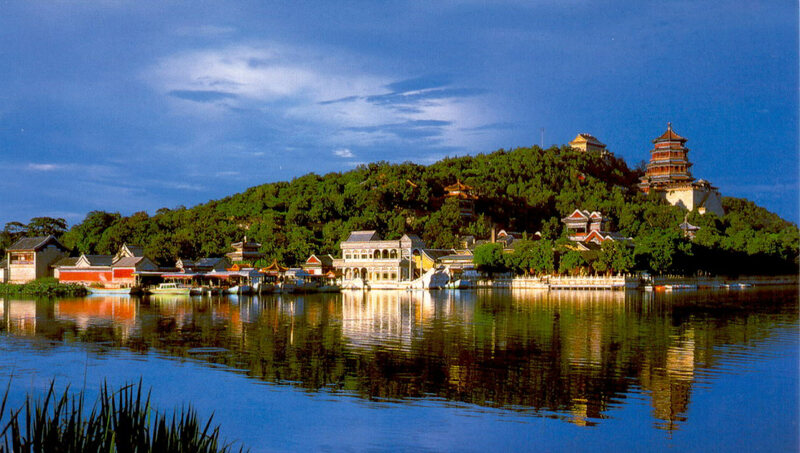 Lijiang is the most touristic city of Yunnan. Listed as a UNESCO World Heritage Site for its old town since 1997, it is located at 2400m above sea level and is mainly populated by the Naxi minority. To help you plan your trip, here is our guide to things to do in Lijiang. In addition to places of interest and activities, you will also find my selection of the best accommodation to stay in Lijiang and restaurants! As a UNESCO World Heritage Site, acclaimed in tourist guides, the old town of Lijiang is of course the main attraction of the city! Attention, to enter, you will have to pay a right of passage of 80 yuan, which is used to finance the restoration of the old city. 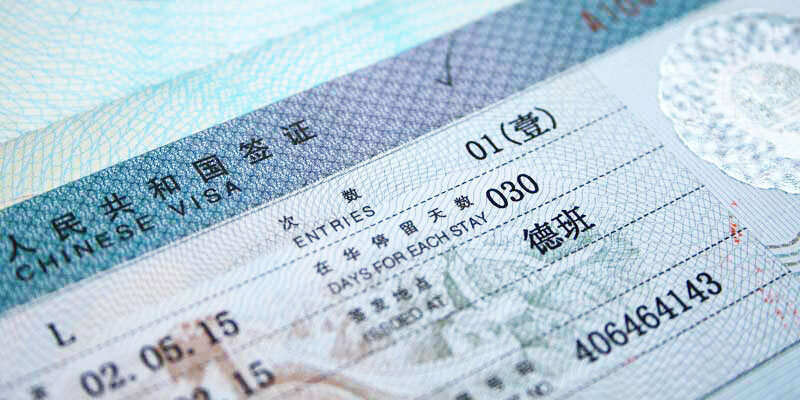 It is valid for one month, and you will be asked when you go to places of tourist interest, even out of the city (jade Dragon snow mountain or the gorges of the tiger jump for example). 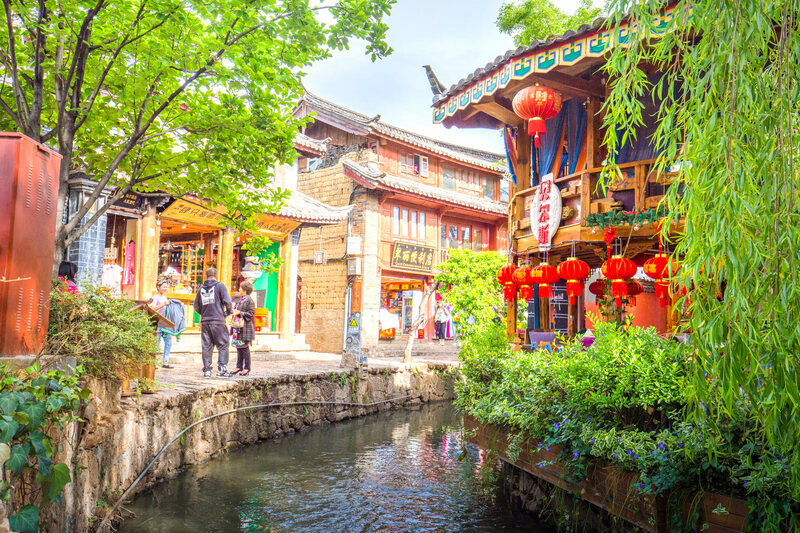 In the old town of Lijiang, you will discover the beauty of Naxi architecture, with its houses fully restored and transformed into shops, hotels or restaurants. Here are the places of interest not to be missed in the old town of Lijiang. 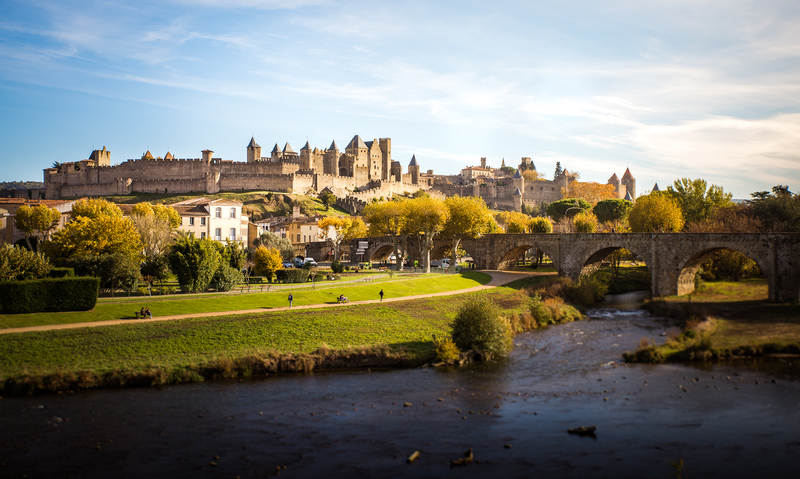 Place des moulins à eau : Very pretty place, beautifully put in value by the peach trees in bloom at least from April. There are benches to sit in the shade of trees, and you can see the elderly dancing in the afternoon! Square street: The other very large square in Lijiang, also very touristy! To see once before going to get lost in calmer lanes. Mu Residence: Also called Mu Palace, it is a large complex of a hundred buildings located at the foot of Lion Hill. 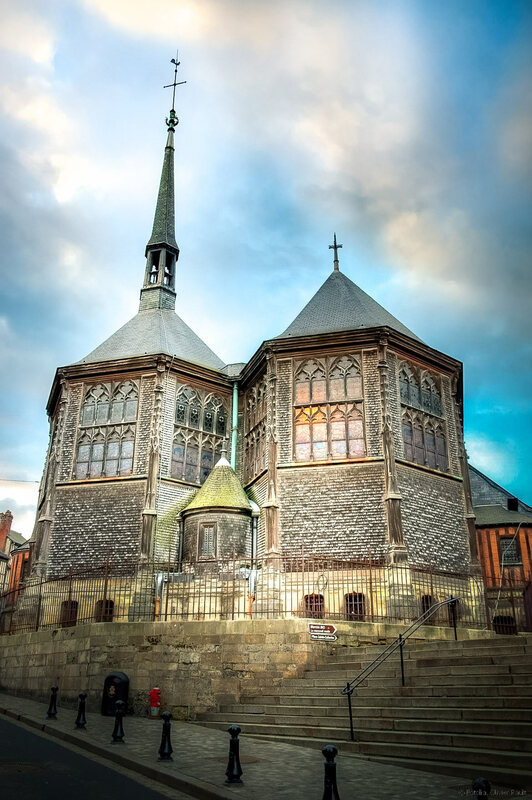 On 6 hectares you can admire the architecture of what was once the center of power of the Naxi people! This is a reconstruction based on the organization of the site as it was before its destruction during the Qing Dynasty. Another attraction of the city are the small music stores, from which escapes a haunting melody, revived by the saleswomen. 1 year after my trip, I always have music in mind! 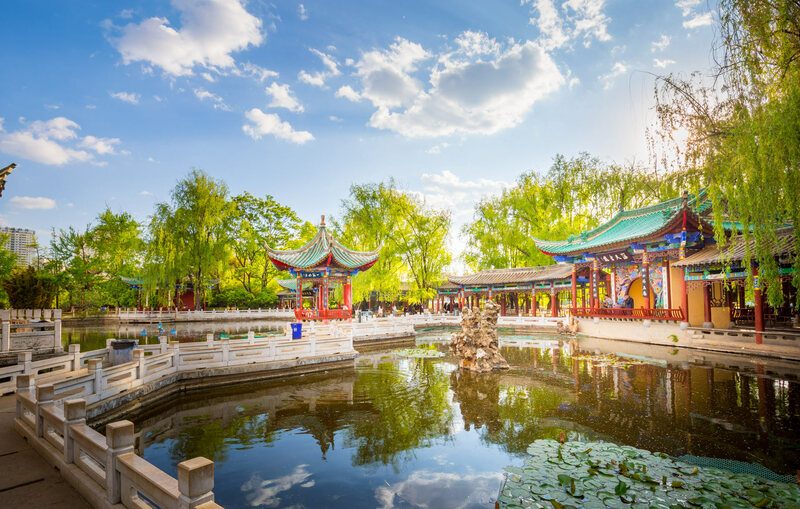 Located about a 15-minute walk from Lijiang Old Town, Black Dragon Pond Park , also known as Black Dragon Pool, or Black Dragon Pond, is where you’ll see one of the most beautiful panoramas in the world. the region. 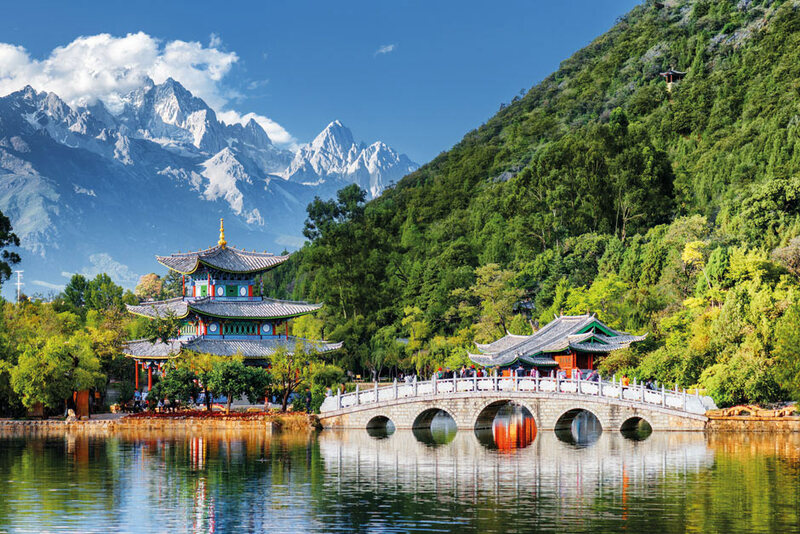 A pavilion and a bridge of traditional architecture are reflected in the water of the pond, with the snowy peaks of the Jade Dragon Mountain as a backdrop. This is the perfect tour to group with the old city for your first day of visiting Lijiang ! The snowy mountain of the Jade Dragon is a small massif composed of 13 peaks, the highest reaching 5600m altitude. 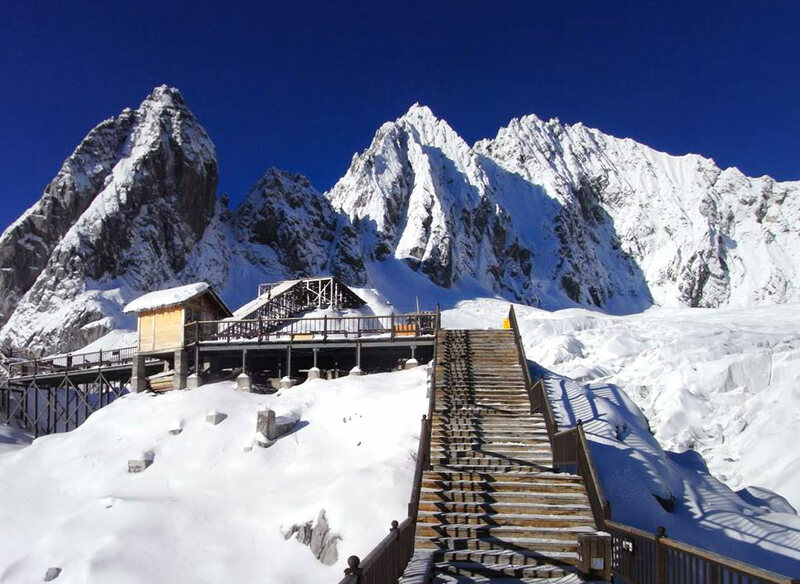 Access to the summit is via a gondola that takes you to the top of the mountain, more than 4500m. If conditions permit (not too much snow!) It is possible to walk on wooden stairs to get even higher! I really advise you to inquire at your hotel and do an organized tour from Lijiang (which usually also includes a stop at Blue Moon Vallley ). It’s a good way to make Chinese friends, but it’s also very convenient because they provide a big waterproof coat + oxygen. Blue Moon Valley, or in French “The Valley of the Blue Moon” is another must-see near Lijiang. 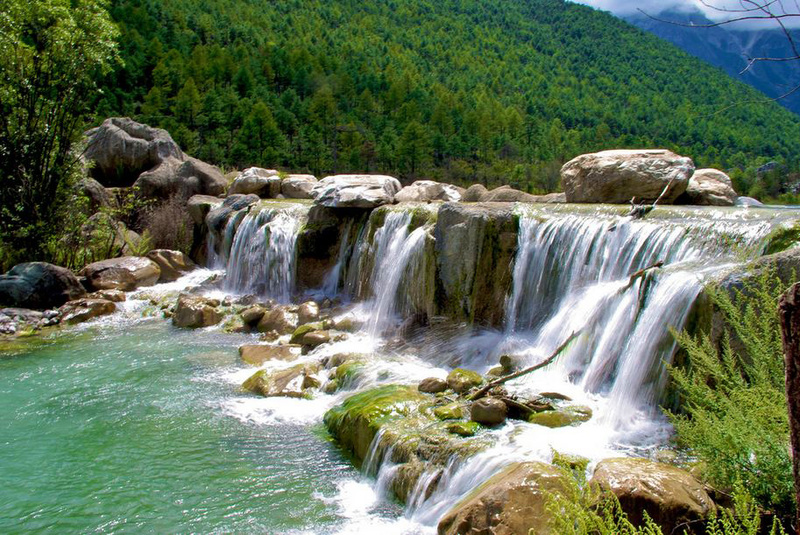 In this valley at the foot of Jade Dragon snow mountain are 4 lakes with turquoise waters, separated by small waterfalls. It is certainly one of the most beautiful photo area in the region! The water is really cold, even in summer, because it comes from the snow. The local legend of the Naxi people also tells that when two people are in love, if the boy enters the water in the water in the middle of winter to prove his love in the presence of the sacred snowy mountain, this one will last forever. 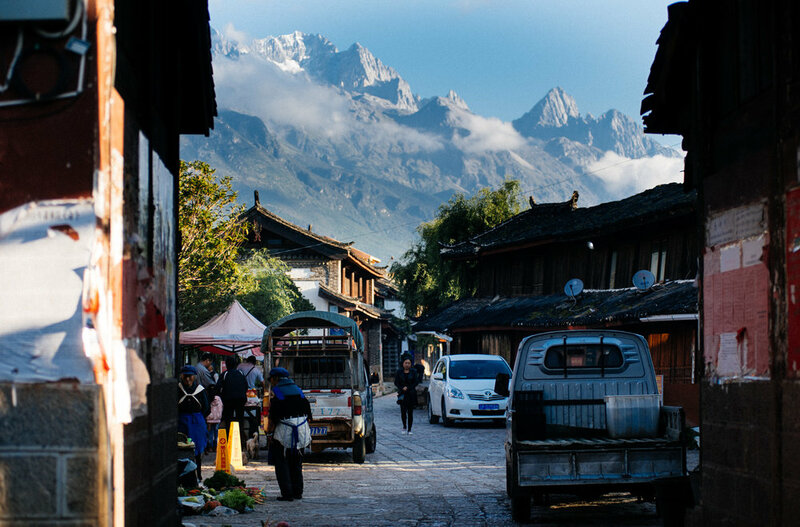 The ancient Shuhe Village is just like the UNESCO-listed Lijiang Ancient Town. It’s simple, it’s exactly the same as Lijiang, but quieter! The canals are also pretty, and the tea museum, which tells you the story of the tea route is very interesting, as long as you are interested in the history of China . Whether in Shuhe or Lijiang, I highly recommend you to try Yak and Goat kebabs, 2 specialties of the region, which are absolutely delicious! As it is not very far (about 5km) It is possible to go by city bus from Lijiang. This village located 8km north of Lijiang is, with the village of Yuhu, a perfect destination for travelers wishing to discover a traditional Yunnan during this tour in China. The village of baisha is best known for its 55 murals dating from the Ming Dynasty (Baisha murals in English) but it’s really not a tourist place, so do not expect a Lijiang Bis! It is possible to go by bike or take bus number 6 from Lijiang. Like the village of Baisha, the village of Yuhu Village is another Naxi village with little tourism. 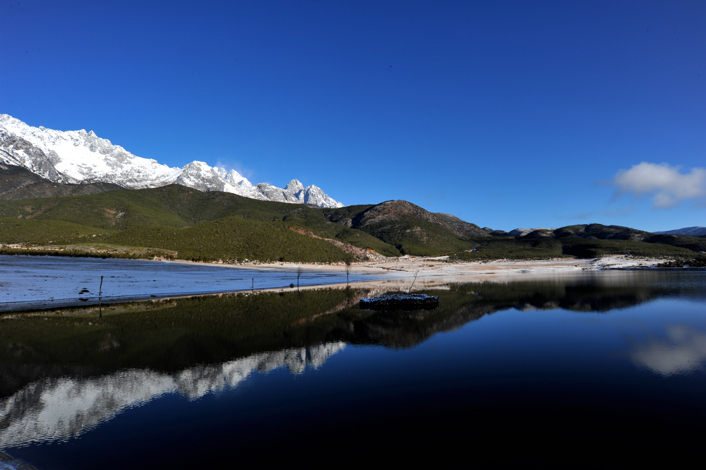 It is located 15km north of Lijiang, and you can group the visit of the 2 villages on half a day! For photo enthusiasts, these are good places to capture authentic scenes of life. 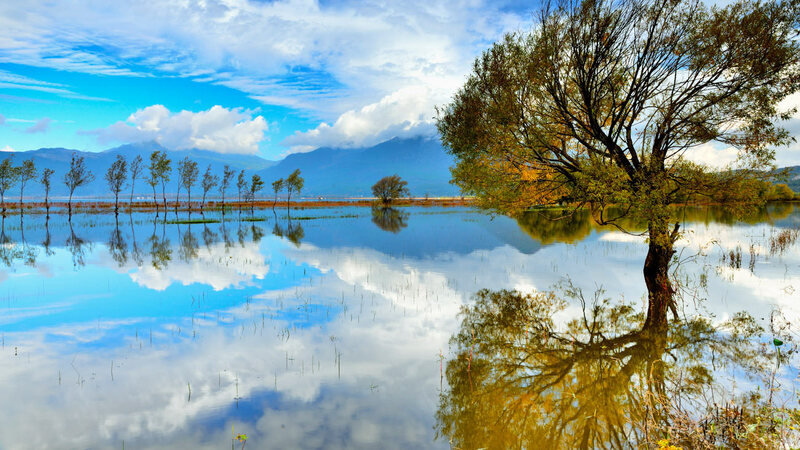 The Lashi Lake is located 10km from the old town of Lijiang and be part of a nature reserve. This lake and the swampy area that surrounds it are ideal for canoeing, horseback riding (it is possible to rent horses or ponies for a walk around the lake) and fishing. The Lashi Lake is a good quiet place for easy hiking! Another option is to rent bikes in Lijiang, and to be transported by taxi to the edge of the lake to go around! 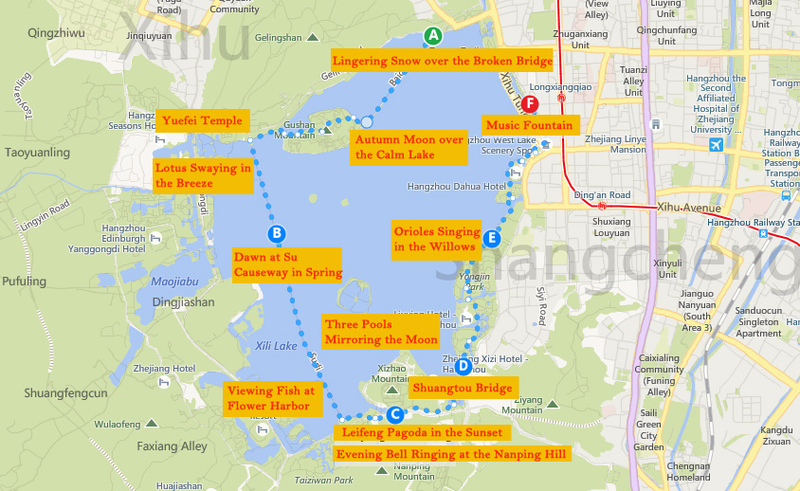 Day trips with local guide and meals are also organized, inquire at your hotel or in a bike rental shop. 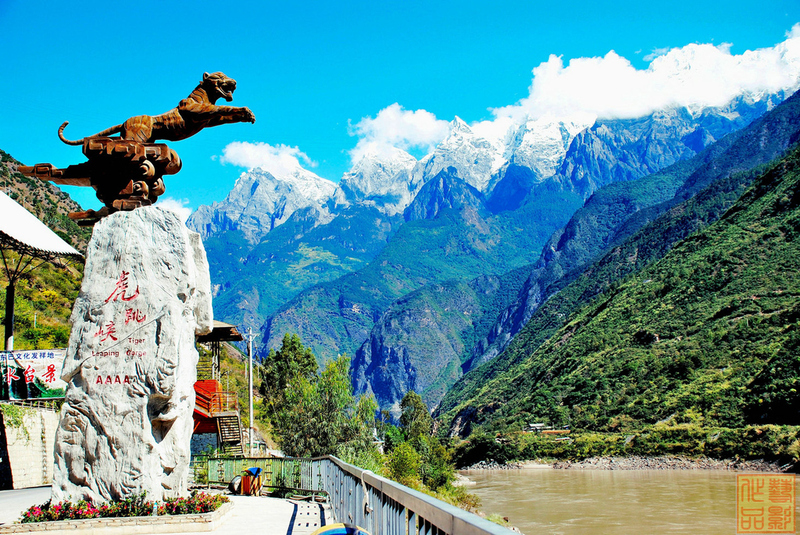 The Tiger Leaping Gorge, 60 km north of Lijiang, is one of the deepest canyons in the world. 17km long, it houses the river Jinsha Jiang, extremely impressive for its flow, especially after the rainy season. It is possible to reach the famous rock on which the tiger would have jumped according to the legend which gave its name to the gorge directly by bus. This is the most touristy place where you will see hordes of Chinese tourists! A much nicer option is to hike for one or two days along the gorges and offer magnificent views of the mountains and the river below. There are several guest houses on the way, so you can hike in several days. It’s not very big, but the place is worth seeing for the beautiful panorama of the valley! This site is located near the village of Sanba, about 100 km from Lijiang and halfway between the cities of Lijiang and Shangri La. 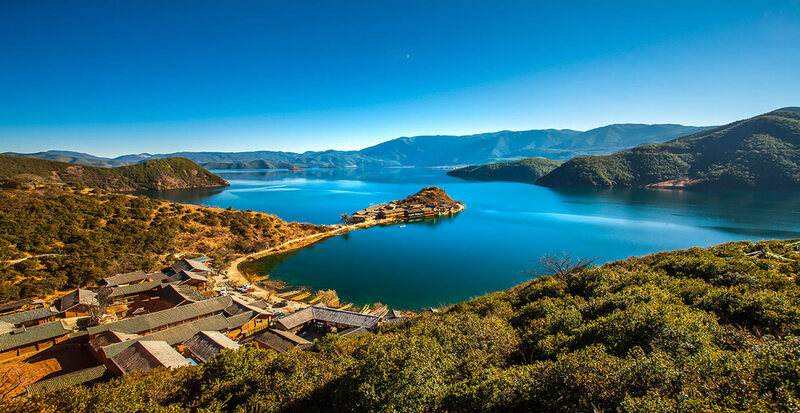 The Lugu Lake is located on the border of Yunnan and Sichuan, 200km north-east of the city of Lijiang. If it is in this top of things to do in Lijiang, it’s simply because despite the distance, Lijiang is the best starting point to go there! The Lugu Lake is also known for being the residence of the Mosuo people, a matriarchal society in which marriage does not exist. Here, it is free love: The connections between men and women are not framed by any dogma, moreover, in their dialect, the word jealousy does not exist! Do not wait too long to get there, the tourist offer is growing around the lake, and the region is likely to be much less authentic within a few years. If you choose to spend 2 days in Lijiang, I suggest you, in addition to Day 1, take a trip to Jade Dragon Snow Mountain and Blue Moon Valley. 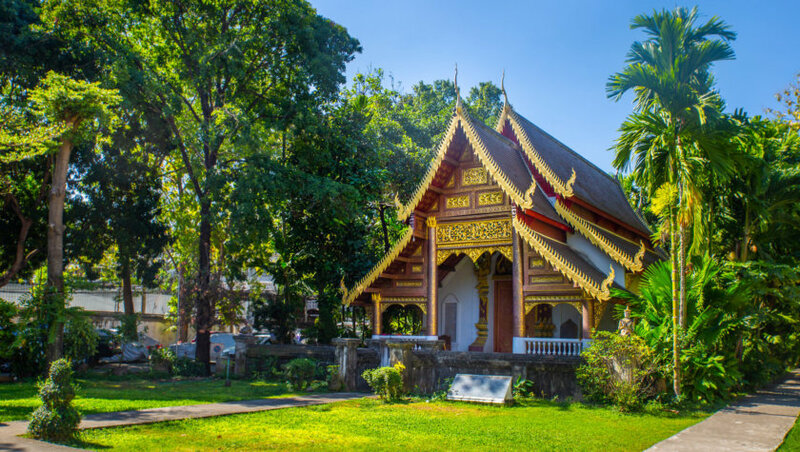 It will be much more exotic for you than to visit other relatively similar villages (even if it is true, less touristy). the easiest way is to inform you in advance with your hotel to organize a tour. 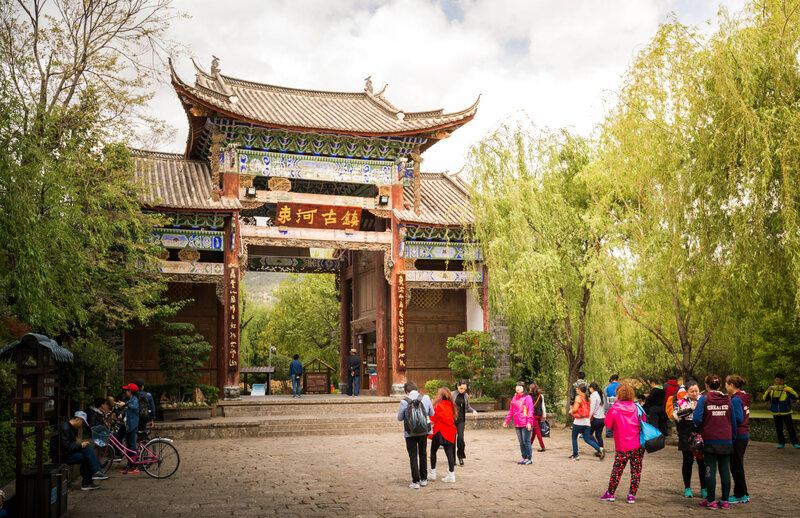 If you choose to stay 3 days in Lijiang, I recommend you to do for example the old town of Shuhe in the morning, then head to Lake Lashi, a peaceful place to do a nautical activity, or a horseback ride! In 5 days in the Lijiang region, you will be able to make a 2-day trip to the Tiger Leaping Gorge, sleeping in one of the hostels on site. 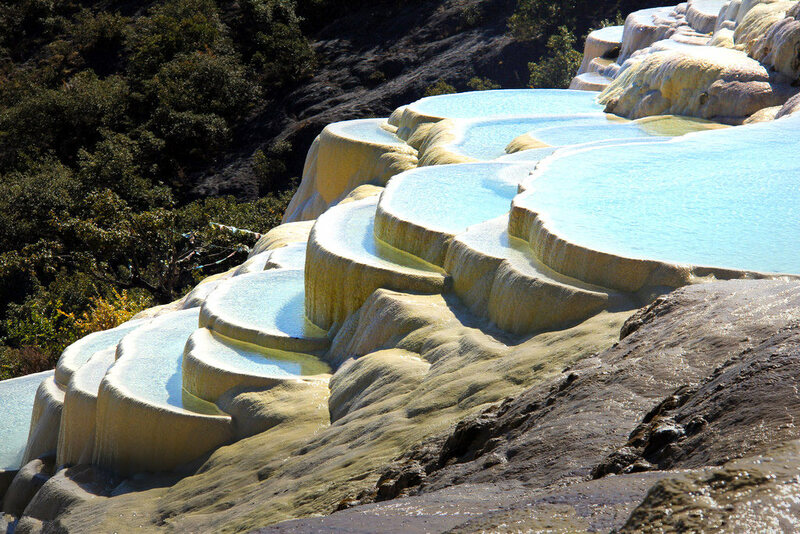 By the way, you can make a detour via White-Water Terraces . 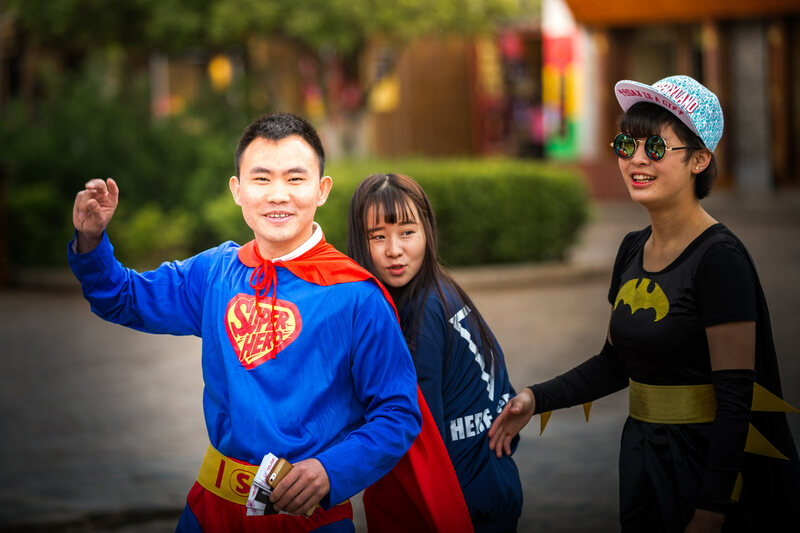 If you choose to spend 4 days in Lijiang, the best is to do the program of the first 2 days mentioned above, to zap the “day 3” and to do the last 2 days as on the 5 day program. 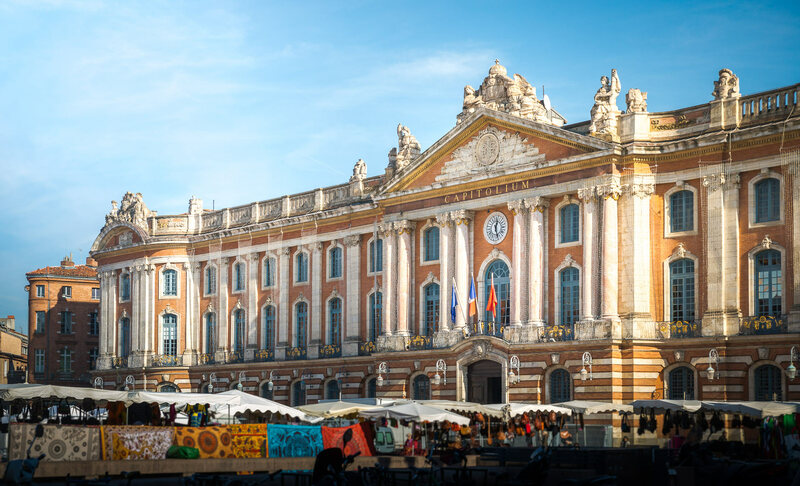 This allows you to really discover the essentials of the region! Lijiang Yue Tu Inn : Double room from 33 euros. My big favorite in Lijiang, and the price is still very correct! If there is no more room, try the Ling Long Xiao Zhu, I heard that good! To get to Lijiang, you have the choice between the train and the plane. Getting there by bus is also possible, but it is recommended to take the bus in China only as a last resort (when there is no other way to get to a place), because of the insecurity on the roads. In addition, the bus often takes longer and is not necessarily cheaper than the train. Dali – Lijiang : For relatively short distances, the train is an excellent solution. This is also the means of transport that I recommend if you come from Dali, because the journey takes less than 2 hours. Kunming – Lijiang : It is possible to take a night train to Lijiang from Kunming. Personally, I prefer to fly for this trip, but the night train saves you one night’s accommodation. For longer distances, it is better to focus on the plane. Have you planned to visit Lijiang on your next trip to China ?